First, I rinsed the apples and quartered them, removing any really rotten spots, but leaving cores, skins, and small dark spots in. 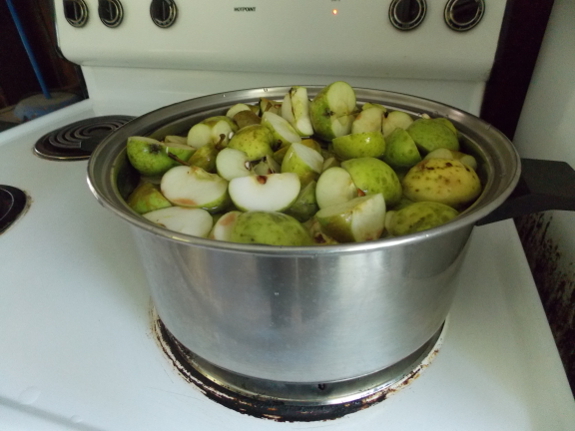 I covered the apples with water, brought them to a boil, then simmered for 15 minutes. 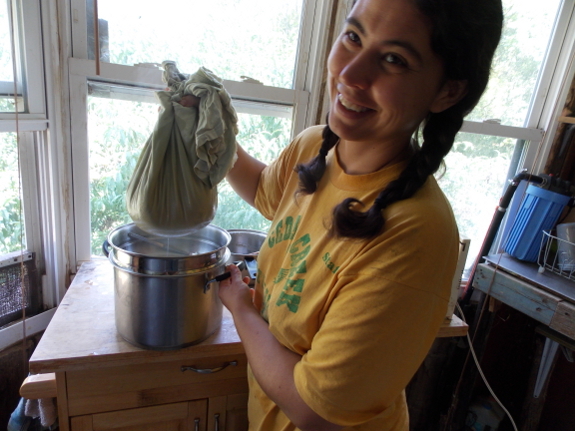 The next step is to strain the apple pulp through cheese cloth, but I didn't have any on hand. Luckily, the internet had a solution --- use an old t-shirt instead. I had to double up the t-shirt so that apple bits wouldn't squirt through the large holes that had relegated the shirt to the rag-bag, but the double thickness didn't seem to be a problem. I put the shirt on top of a steamer, the steamer on top of the pot that fits beneath it, and the apple pulp in the shirt, then waited about ten minutes for the juices to ooze out. Next, the author recommends putting the apple pulp back in the pot, covering it with water again, and simmering for another 15 minutes to get yet more pectin out. At the end of that period, you're supposed to remove the apple mixture from the heat and let it stand for ten minutes before straining again. Since this second time around is the last strain, you'll want to squeeze everything you can out of the apple pulp, which means waiting until the contents are cool enough not to burn your hands. The author says you'll harvest a quart of juice for each pound of apples you started with, but I used less water for the second round of boiling (just covering the pulp) and instead ended up with closer to a pint of juice per pound of apple. A quart of the less concentrated apple stock is supposed to be equivalent to half a bottle (3 ounces) of store-bought liquid pectin. I'll tell you more about my first attempt to jam with this homemade pectin later, but I wanted to close by mentioning other recipes I've seen for extracting pectin from apples. One recipe recommends cooking your apples for several hours, which would presumably concentrate the pectin (although I thought I'd read that extended cooking damages pectin). 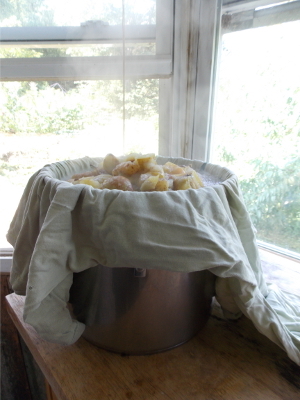 Another recipe simply calls for adding apples with the other fruit while making jam instead of extracting the pectin first --- in this case, it's recommended to put the skins and pits in a cheesecloth bag to simmer with the jam then be removed at the end, while the apple pulp is included with the other fruit. 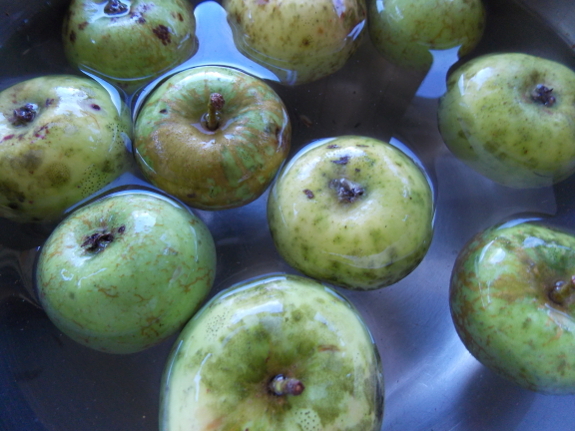 I'd be curious to hear from anyone else who's experimented with using green apples (or other non-store-bought components) to make your own pectin. Please comment and share your experiences! Our chicken waterer is the best way to get chicks off to a healthy start. I have made raspberry jam using diced (~3mm) pieces of green apple, no cores or skins. Its been years, but it worked very well, and helped to make the jam, not quite so strong. 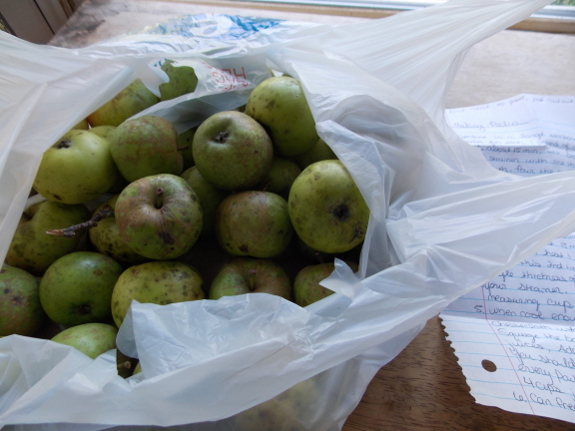 I had a bumper crop of Lodi apples this year. They are nasty to eat but loaded with pectin. I cooked cut up apples till soft (30 minutes or so) with water just under the top of the apples and then extracted the juice/pectin in a jelly bag overnight. I canned some and froze some. You can make jelly with 1 part apple pectin to 1 part berry, peach etc. juice. Works great. You can also make fabulous apple jelly with the peels and cores left over from apple pie filling. I've been doing a version of this for years. Until recently I've had to buy apples but my process is: Acquire about a case of apples and about 6 to 8 gallons of blackberries. Cook and juice the blackberries, freeze the juice. Peel and core the apples, wash the flesh with lemon juice and pack in the fridge. Cover the peels with water and simmer for an hour then strain through a jelly bag, refrigerate the pectin. Make and can apple butter. Make and can blackberry jelly. Last year I got about 50lb of free apples and 8 gallons of berries and that netted me 14 pints of apple butter and 27 pints of jelly.